Each class meets for approximately 1 hour for 7 weeks. Puppies must be 16 weeks old to start the Level I class. We recommend that they have their final Parvo vaccination before starting class. Our group classes are fun, dynamic and very educational. 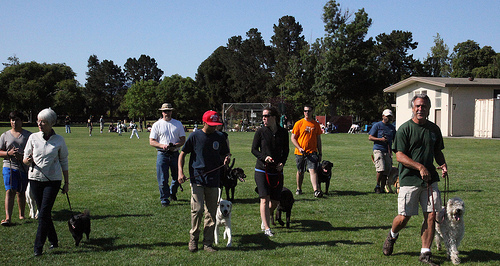 The main target of these classes is forward progress toward reliable off leash obedience performance. By that we mean that your dog is off leash and you give a command from any distance away and your dog obeys. If you are just starting out in dog training this might sound impossible, but it’s not. We’ve created 4 levels of classes to help you achieve this goal. Our class levels aren’t about age as much as experience. We want most dogs to start at Level I and if it’s clear you and your dog are ready to something more challenging, we’ll move you into the appropriate class level. Every class addresses socialization and specific behavior issues, plus there is always time for your questions. We start to build the foundation for obedience. That means loose-leash walking, sit, down, stand, stay and the very beginning of recall. We briefly review the things learned in Level I and then move you and your dog forward with working on motion commands, commands from 6 feet away and eventually progressing towards using a long line (50 feet) to start gaining control at a distance. In this class, our instructors get more particular about accuracy with your leash skills and reaction times. We maintain our focus on off leash reliability by working more with a long line. We also practice motion commands, spontaneous commands and recall. This class was designed especially for those who enjoy obedience training with their dog and want a more demanding class. You will learn to fine tune your leash skills, sharpen your reaction time with your corrections and anticipate your dog’s reactions to various distractions. This intense class is not meant for everyone, you need to have completed a Level III class session (or have permission from one of our trainers) and have a desire to be challenged.